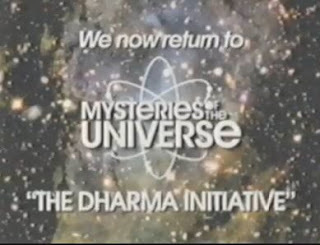 The second Mysteries of the Universe video has been made available at ABC.Com. It is almost twice as long as the previous one and is more like an episode of the series. 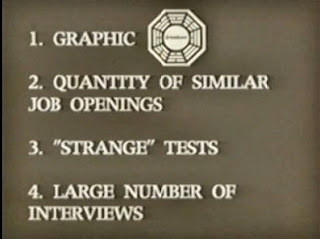 At the end there is a slide to say that an extended version of this will be seen exclusively on the Lost season 5 DVD (not Blu-Ray). So is the Lost University for the Blu-Ray release and MOTU for the DVD ? It mainly concerns the recruitment of Dharma personnel and talks about a person called Phil (a security guard - sound familiar ?) and also someone called Olivia (see picture) who appears to be Olivia Goodspeed. There are a couple of mentions of secret societies and hints at aliens, however these seem more in keping with the concept of such a show from this time rather than a direct hint at a Lost connection. It looks interesting! I've found some weird or funny things there, I'll post them asap. And you're right, perhaps all the conspiracy stuff is just as a zeitgeist of these times, not really related with Dharma. I'm curious, without checking back at the video (I'm on my way out the door) does the video have the usual DI date on it anywhere? It looks like it was made in the 70s, but I think that they mention the UNLV event as being in 1978. Tx! Can't wait to see what you find Merzmensch! There are no dates in the video apart from the 1978 date as far as I can see. There are a set of roman numerals on the heading to the newspaper, but I think this is a volume number of some sort. It's still a very large number that I can't quite make out. I'll see if I can do some image enhancement to make it clearer. Thanks for forum link Mark! I've been following Scheer's blog since CC, and it might be just a promotional thing that he's set up for his art, but who knows. I find it difficult to believe that anyone who saw that painting in a garbage can would not grab it for posterity, and just leave it there in the trash, heheh. This story with Sheer looks funny. Perhaps he wanted to make an ARG (even if abc couldn't support it financially), so he does it now in his own way? Yes, I don't know what to make of the Scheer blog either. Zort and Merzmensch: You are doing a great job keeping us all up-to-date during these lazy days of summer! Great to see all the screen captures...much appreciated! I don't know about the Sheer stuff either. If ABC and/or LU is part of the address, that would just lend itself to being sponsored by ABC for the "bit" at Comic Con. Using Darlton's names in the url doesn't seem ARG-ish to me. And this hiatus, everything that's been thrown out there so far is very "outside the fourth wall" type of material. No separation between reality and fiction left there now that I can see! In the picture of the japanese looking house the person walking towards it seems the thing that is out of place. Sort of like a man in black type figure. I've been looking at the pictures of the missing people on the video and they are all displayed twice apart from one set of three the second time they are displayed. It may just be a bad cut on the first time but it may be significant. Click here to see all the missing people from the first and second time they are displayed. Hmm, I wonder who they are in that single pic? Heheh, on the 42nd all calendars will explode! :-D I wonder if there are any ancient calendar months with 42 days? j/k, I think. Just a heads up, folks. DarkUFO users and Fuselage users have confirmed that the Paul Scheer websites are registered with ABC. Looks real to me, but what do I know? I've created a NEW POST about the new information. Der Merzmensch - I'm off to read your post now to see if there is anything I've missed ! Yeah! I knew, WAKY radio was a clue!